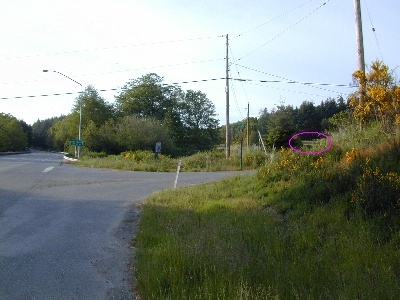 Location: Lat: 47.6745, Long: -122.5313, Alt: 163ft Click here for overhead views. Click here for interactive Google map. If you're interested in how these winegrapes reached the Puget Sound AVA, you can read about it at PSWG.org, Puget Sound Winegrape History. Our soil is "Alderwood very gravelly sandy loam, 6 to 15 percent slopes" with "restrictive feature: 20 to 40 inches to dense material" from USDA soil survey. From Shilshole Bay Marina in Seattle, when you look across Puget Sound, our vineyard is exactly 6 miles as the crow files, due West, immediately over the hillside of Bainbridge. From the Seattle downtown waterfront, say Pike Place Market, looking straight out across Puget Sound, we're just over the hillside you see at between the "one thirty" to "two o'clock" position. We have a rose plant at the end of each grapevine row for many reasons (do ask next time you're at the vineyard)... See our row end roses page for details on the plants themselves. In November 2004, we invited friends to come and take a Christmas tree, and accepted payment as donations for several local charities. The following Spring (2005), we then cleared the remaining Christmas trees, and planted this newly cleared area to a variety of different grapes; another 250 MdB, plus Siegerrebe, Zweigelt, Pinot Noir, Pinot Gris, Castor (a Muscat), and Reislaner. 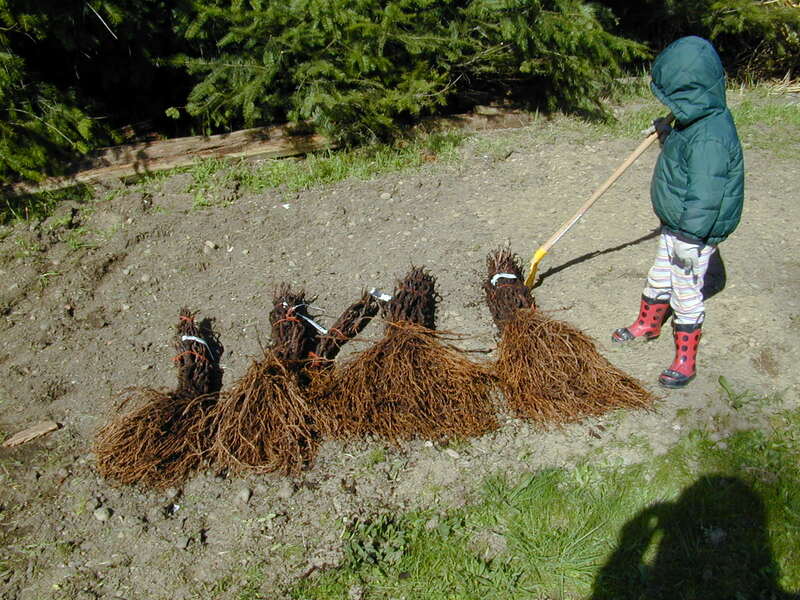 Also Schoenburger on several different rootstocks from Cloud Mountain Farm in Everson, WA. 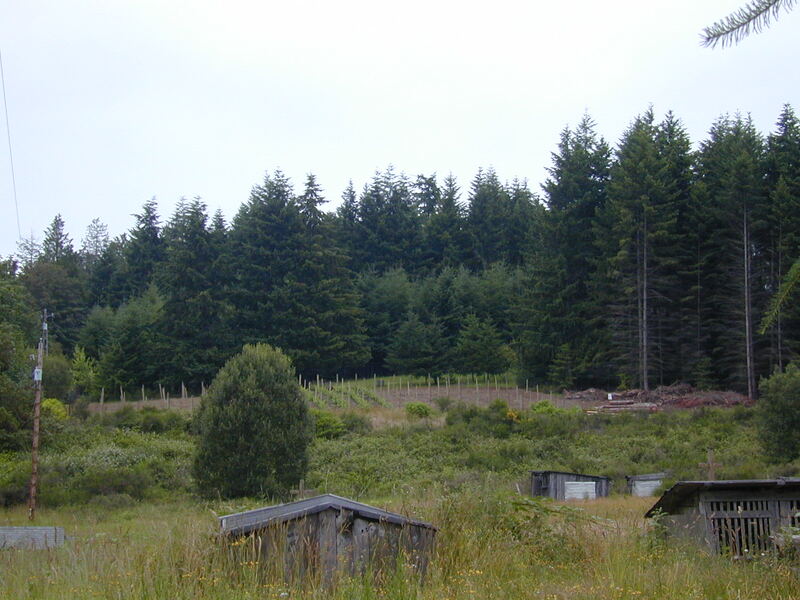 Spring 2008, we have cleared and are in the process of planting the hillside immediately below our vineyard, on city-owned property known as the "Morales" parcel. This property was bought in open-space bond and is reserved for agricultural use. 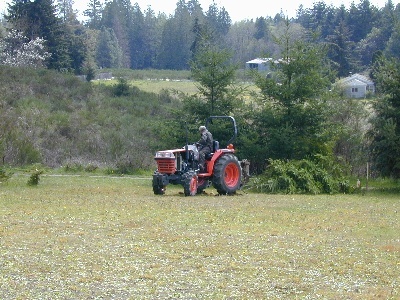 We will be working about a half acre, expecting about 400 new plants. These will all be MdB. Summer 2010: Quick list of changes: Castor has been removed (never ripened), Trousseau Gris has taken it's place. The New 1/2 acre of additional MdB and 1/2 acre of Sieg are doing great, but have another year to go before cropping. 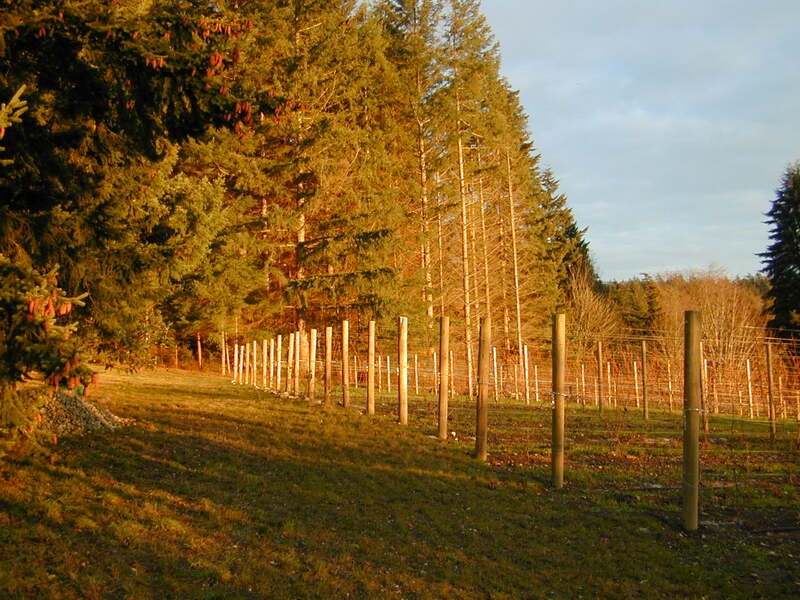 We're planning on clearing the remaining trees and extending the vineyard next to our home in order to plant reds, some Zweigelt but mostly Pinot Noir. (Taken, 17-Jan-2013, Garret Veley) Driveway between Perennial Vintners vineyard and leased Morales hillside. If you look carefully you can see a fine layer of frost on the black plastic deer fencing. Mike standing in PV's own vineyard, almost looks false-colored due to strange fog background. 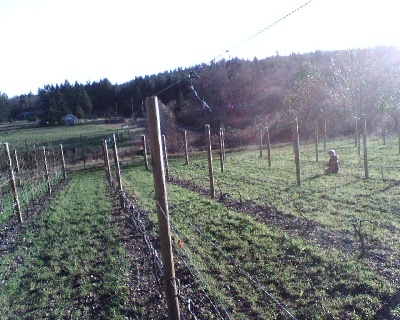 We were about a third finished pruning this block at this time. Our weather station is visible. (Taken, 17-Jan-2013, Garret Veley) Mike and visiting pruner Kimberlee Adams are watching the camera set up. We're standing on the Bentryn property where I'm leasing a half acre for Siegerrebe grapes. Visible are BIVW's Pinot Noir and Akio Suyematsu's raspberries, the latter is the source for our Frambelle dessert wine. The box on a post is for birds who nest here and help by eating bugs that would otherwise plague the nearby irrigation ponds. Mike and Kimberlee again at Mike's Siegerrebe block on the Bentryn Property. The plastic tents in the distance are part of several fields on the island in use by Butler Green Farms. (Taken, 17-Jan-2013, Garret Veley) Mike and Kimberlee again, this time near the old red water tower and the Suyematsu Farm sales shed. (Yes, Mike got a call and is talking on the cell phone.) We're standing next to the two rows of Madeleine Angevine which had been pruned at this point, and the other grapes to the north are the Müller Thurgau, where we spent the rest of the day working. There's a couple of pumpkins on the ground left over from the Autumn season, and one old plum tree in the vineyard. Mike showing Kimberlee how to prune in the Müller Thurgau. Be sure to look up, you can see the fog line directly above us! Siegerrebe plant before shoot thinning. (full size image 129Kb) (Taken, 01-Jul-2010, MikeL) Same plant after shoot thinning. The shoots I've pulled are laying on the ground in front. Looking due south towards the Morales farm. Although it looks like snow, it's just a serious layer of frost, you can see where it's melted in grass in the foreground. The grapevines have been long dormant at this point, so it's not a problem. (full size image 443Kb) (Taken, 27-Dec-2009, MikeL) Sun shining through the frosted evergreens on the Morales property. Looking up from the bottom of the Morales slope. Note the frost stops part way up the hill, clearly showing the cooler frost pocket on the valley floor. (full size image 452Kb) (Taken, 27-Dec-2009, MikeL) Closeup of frost on the deer fence at the bottom of the Morales slope. 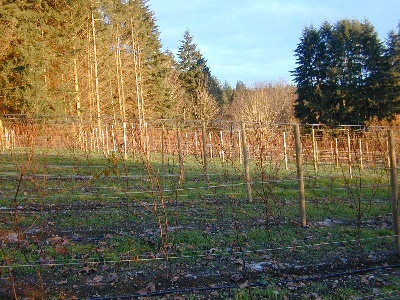 Closeup of dormant grapevines with frost layer. Visitors getting the tour and grape-growing lecture in the vineyard. (Yes, it's the same group above and below on the hillside -- these multi-image panoramas are a lot of fun to make!) Camera is in the center of the Morales hillside. Our guests were: Kathryn and Jeff Tillotson, James Patterson, Angela Mansfield. 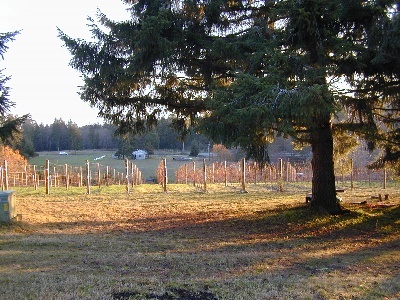 Looking NW from the SE corner, across the vineyard. Many shoots are at the first catchwire. (full size image 740Kb) (Taken, 11-Jun-2009, MikeL) Looking due east across the bottom of the vineyard. The new rose plants at the bottom of the rows are opening up. Grapevine before flowering. The inflorences will become flowers, which will in turn become grapes. (full size image 670Kb) (Taken, 11-Jun-2009, MikeL) Grapevine flowering. This plant is way ahead of the others as it is a rootstock plant (not a fruit producer), "Schwartzman". From my experiences to date, this is an excellent choice for advancing Pinot Noir ripening in the PS AVA. 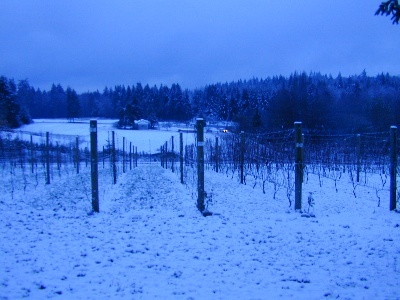 A lovely shot of the vineyard with a touch of sun and a touch of snow. Just a quick few words about this year. Although this was the latest starting ripening season the Puget Sound AVA has ever known, we got good weather later on, which continued on very late into the year (our final harvest was 30-Oct -- latest ever), thus making up for a lot. Our new planting on the City-owned Morales parcel (see below) was quite successful. Of 387 plants put into the ground in Spring, 72 didn't make it, for a total success rate of 81%; not great, but not bad either. We also had a serious frost event 2nd weekend Oct, the effects are visible on the lower plants in the image. This was an unusually early event, though if we see it again in future years, we'll probably replant the lower portion of the hill to an earlier ripening variety like Siegerrebe. 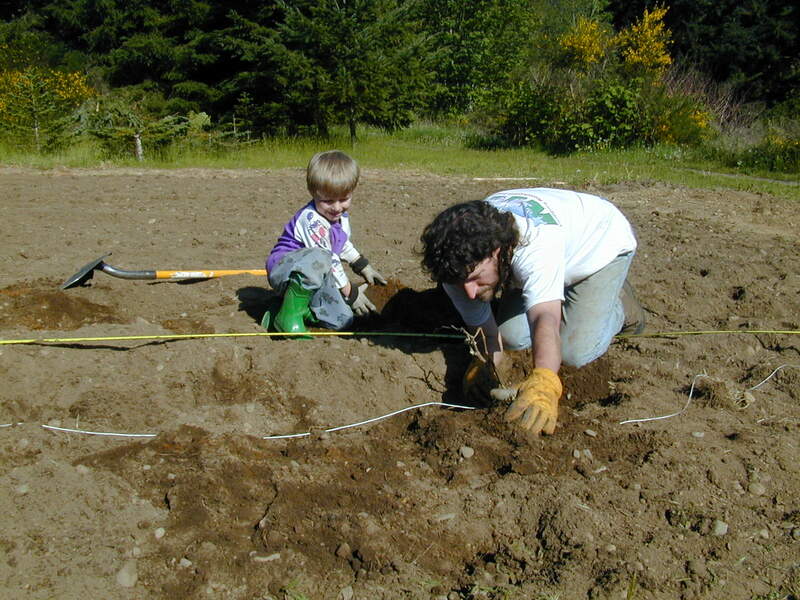 Mike planting Siegerrebe in our new block on the Bentryn property at the Day Road farm. 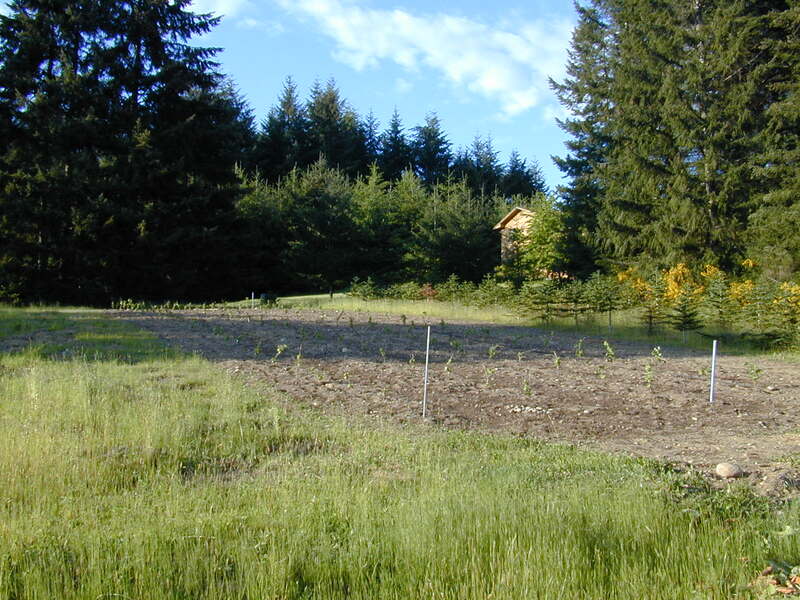 This is about 1/2 acre, consisting of about 350 plants. (Taken, 01-Jun-2008, Omie Kerr) Beth and Ellis planting same Siegerrebe block. We had a brief snow that turned into a mass of rain which completely flooded our driveway. (I was too busy digging trenches to take pictures of the flood.) Looking due South from the top of the vineyard just after sunset -- a car is visible just pulling into the driveway. We had a lovely Fall afternoon a few weeks back where I walked around and took a few pictures of the vineyard. Looking due South from the top middle, standing in the lawn. Looking ESE across the upper vineyard headland from the top NW corner. Looking ESE through the vines from the middle west edge. Fantastic sunset with the last corner of the vineyard illuminated and bright orange clouds. Nice view of the vineyard. You can see where I've done some manual clearing on the slope below the vineyard in hopes of my expanding into that area next Spring. You can also tell the 4 rows in the center that are the original planting. Looking sideways through the Melon de Bourgogne. Closeup of young plants. These were 1 year old plants from the nursery, put into the ground in 2006. 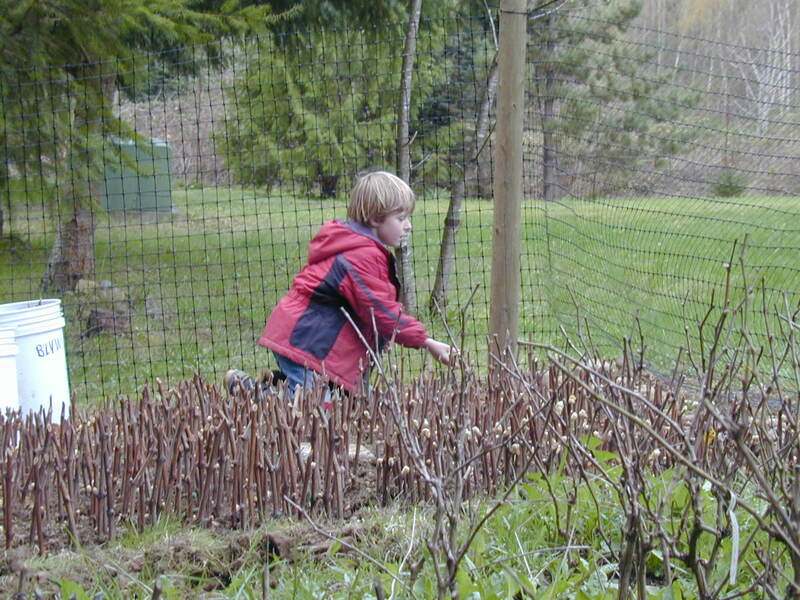 You can see we've pruned back most of the extra wood so as to train up a single strong trunk. This closeup lets you see our irrigation system (T-Tape -- the black stripe), and a line of dolomite lime (white powder) applied after harvest. You can also see that we've established a lush green Winter cover crop of annual rye. We are very careful when spreading the seeds to keep them in the aisles, so as to make it easier to weed under the plants next Spring when we till in this cover crop. Looking upwards across the Melon de Bourgogne. Our house is visible at the top center. 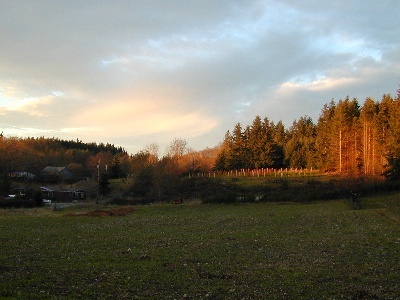 Looking NW across the vineyard. 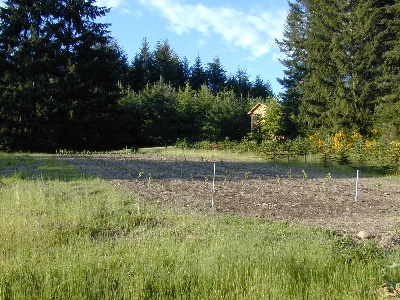 This area is the "experimental" block with several different varieties planted. The immediate first row is mostly rootstock plants so that we can do our own rootstock propogation in the future. You can see one particular plant is still holding onto it's leaves, event though the others have all dropped -- I think that's the Schwartzman rootstock. Note clean cultivation -- the bare dirt keeps vineyard temperatures much warmer than would a grass or weed vineyard floor. Leaf pulling -- we remove most of the leaves immediately around the grape clusters which helps the grapes to warm in the sun, which dries them out helping prevent molding, and allowing sprays to penetrate better. Our new "Pesticide Free Zone" sign! This is a voluntary self-policing endorsement. Catchwires with vertical shoots tucked in between them. Red clip visible that holds wires together. Again this year, we've leased one-half acre of Müller Thurgau grapevines from our neighbor, Bainbridge Island Vineyard and Winery. 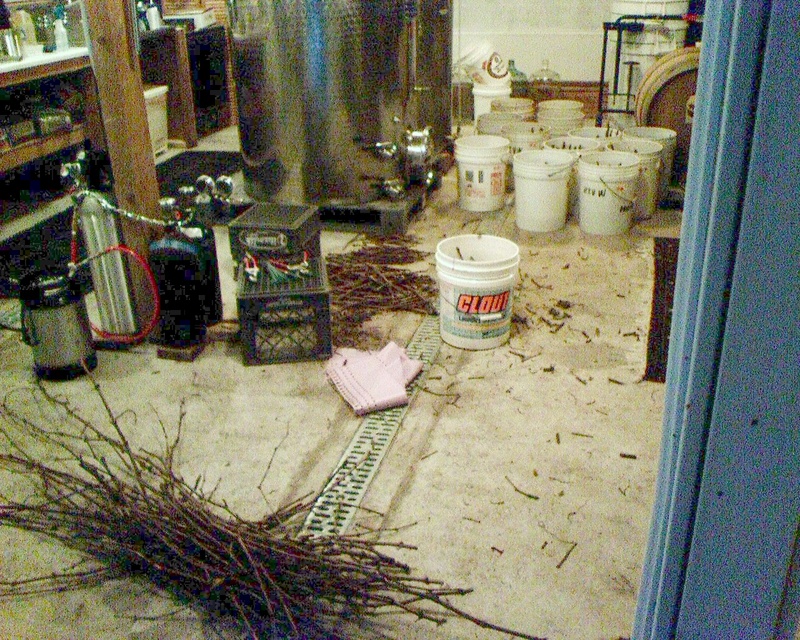 We harvested about 2 tons, yielding about 170 gallons. 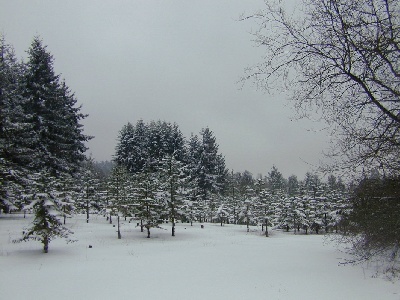 (full size image 424Kb) This is our block seen in the snow from across the Suyematsu farm pumpkin patch. (full size image 429Kb) Looking through our block in the snow. 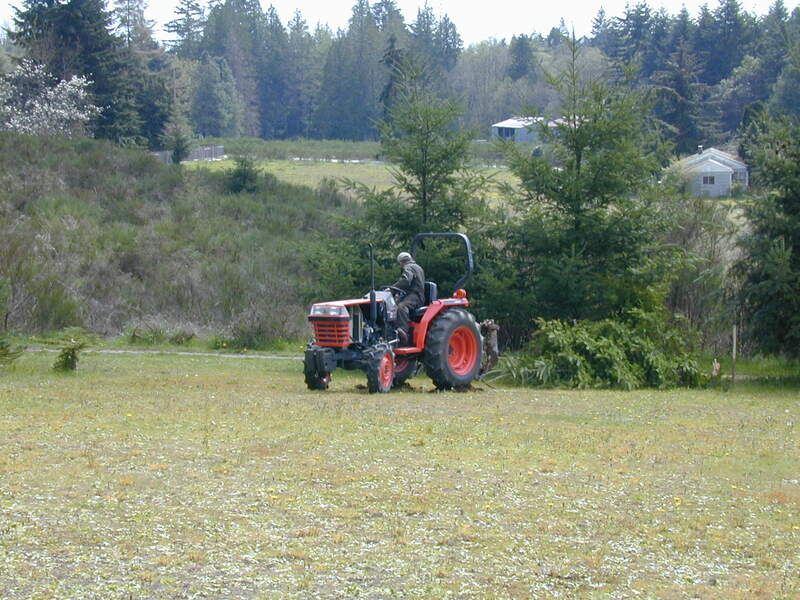 28-Jun-2005: We took delivery of a new Kubota tractor this weekend -- now we really feel like a farm! 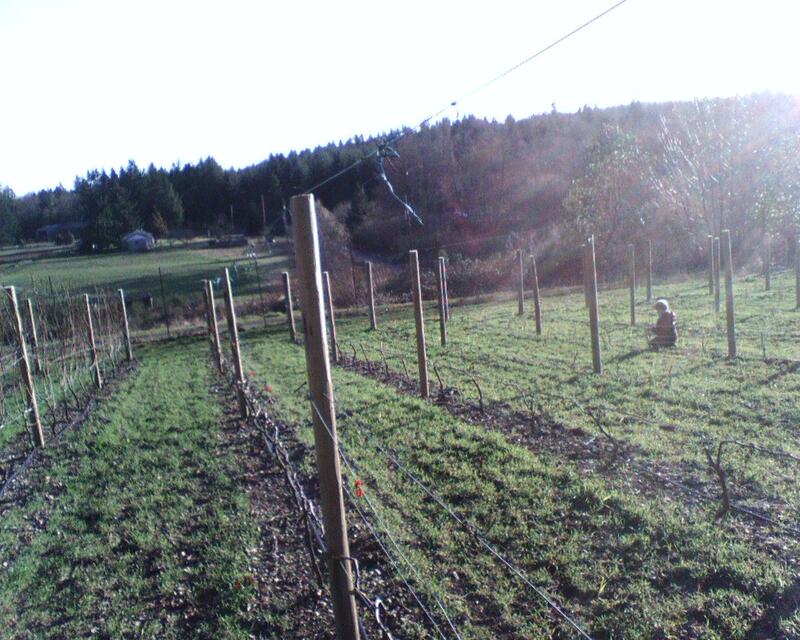 We drilled all the postholes for the entire vineyard (132 of 'em! ), and dropped the poles into place, though have not gotten them all seated yet (which is why they look crooked in the photos). 23-May-2004: Now that I've done some clearing of the Scotch Broom from along our driveway, our newly planted vineyard is visible from the main highway. This is the intersection at Lovgren Road & SR-305.. 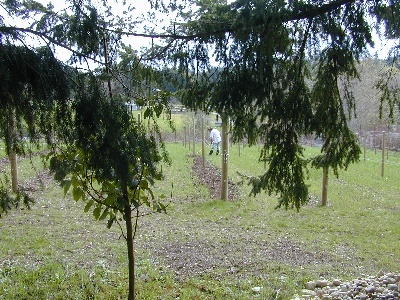 The house came with an existing vineyard. We don't know it's exact history, but we can state unequivocably that it has been ignored for about 20 years as there are trees growing through of that age. We believe the plants are Muller Thurgau. At this writing we have no plans to work this area as there are a lot of trees that would have to be removed. Perhaps we'll be looking into it in 2006. 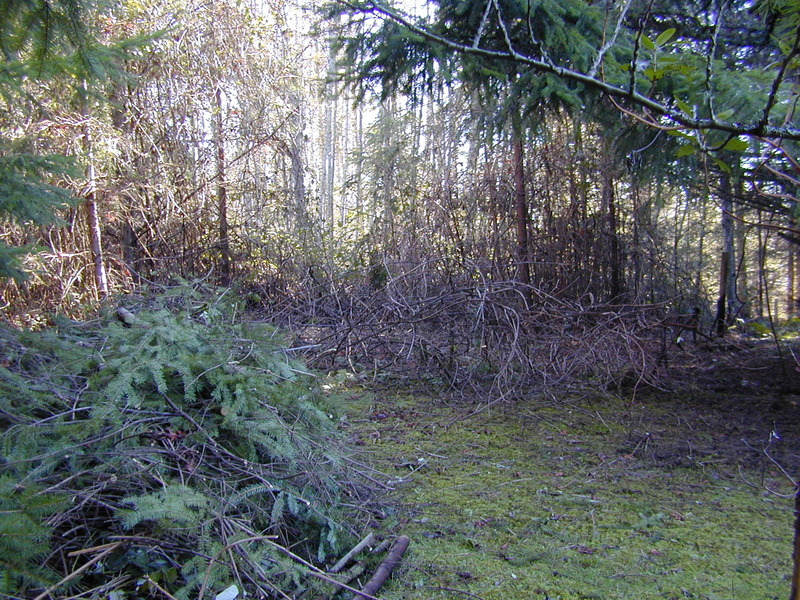 Another portion of the property was previously a Christmas tree farm. 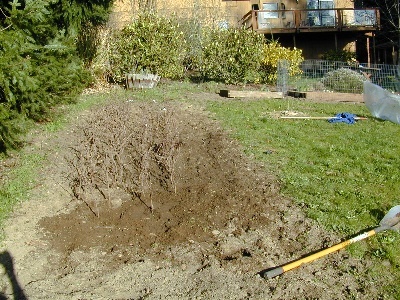 This was left by the previous owner with a large cleared area in the middle, just big enough for 100 grapevines on 7' rows. Beth and I both adore the French Muscadet wine from the Melon de Bourgogne winegrape. 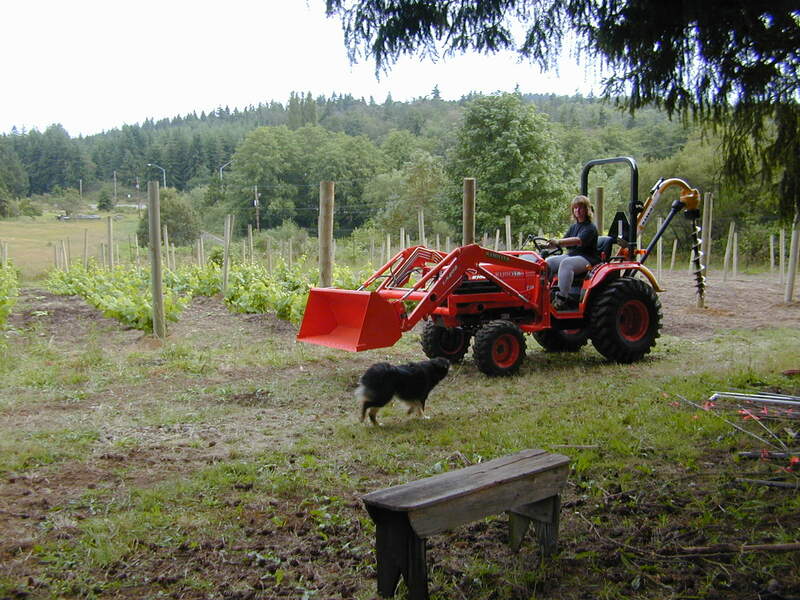 We had made wine from this grape before, from a very small plot in Sunnyside (eastern WA), and loved the wine. A little research showed that the area in France (near Nantes) where this wine comes from, is a similar maritime climate to our Puget Sound basin. We felt that in the more appropriate cooler-climate Puget Sound AVA we could make an even better wine! So I asked around the wine community about getting some plants, and found that Inland Desert Nursery in Prosser, WA had 102 plants they'd love to sell me! 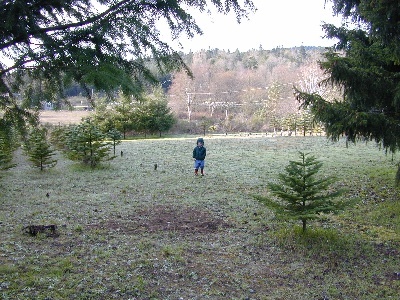 Our Christmas trees, soon to be vineyard. This was taken from the top of the hill looking down.